The striped cucumber beetle is one of the most damaging pests on cucurbits, such as squash, cucumber, melon and pumpkin. The larvae can cause severe damage to roots. A single beetle can cause severe damage to an emerging plant by feeding on the lower surface of leaves. Adults are known to feed inside flowers, preventing pollination and fruit set. 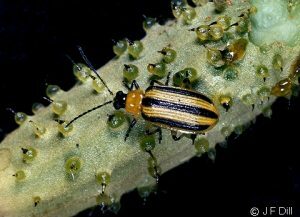 These beetles also spread bacterial wilt, cucumber mosaic, and squash mosaic virus. The striped cucumber beetle is about 1/5 inch long, and has a black head and yellow-green wing covers with three black stripes. The orange-yellow eggs are laid near the base of host plants. The slender white larva grows to about 1/3 inch long and is dark on each end. There is one generation per year. Only unmated adults overwinter. They overwinter under leaves, rotten logs or almost any other debris on the ground. They emerge in the spring when soil temperature reaches 55°F. Then the beetles feed on pollen, petals and leaves of willow, apple, hawthorn and more specifically, on their alternate hosts of goldenrod, aster, etc. As soon as cucurbits, the preferred hosts, come up or are transplanted, the beetles fly to these plants to start feeding and mating. In a few days, the female lays eggs in the soil. The eggs hatch in about 10 days. The larvae work their way to the plant roots where they feed for the next 2 to 6 weeks, sometimes causing severe damage. The mature larvae pupate in the soil. The adults emerge in 7 to 10 days. Because overwintering cucumber beetles are around by the time cucurbits are up or transplanted, it is important to check at least daily to control the pest. Handpicking is most effective if done early in the morning. These beetles are easy to kill, but because more keep arriving on the plants, it sometimes seems as though controls are not effective. Barriers of row covers (which may have to be suspended over crops with wire hoops to prevent foliar abrasion in windy locations) such as spunbonded remay, cheesecloth, etc., can protect your plants; remove by midsummer to permit pollination. Removal of goldenrod, aster, etc., from the vicinity of cucurbits helps reduce the number of beetles. Removing plant debris or keeping it to a minimum is also advisable. Insecticides labelled for vegetables containing pyrethris, pyrythrin, or carbaryl (Sevin) should control the beetles.